Some thoughts in contemplation of the ending of the currently showing theatrical release of The Return of the King. Like a Beethoven symphony, it ends not with a single bang but with a complex row of codas as each theme is tucked away. There were certainly people in the theatre who expected this multi-movement, multi-themed symphony of cinema to end with a quick, pat ending, just like any hour-and-a-half Hollywood action flick or screwball comedy. But Peter Jackson's work, like Tolkien's, like life, is far more involved, and has far more to resolve. Life doesn't end when the heroes meet together, slap one another on the back, and exchange compliments on a job well done. The world swept into cinematic life by Peter Jackson and all his crew and actors doesn't end with the lid closed and the ribbon tied on the box; but the movie does push all the loose strands back into a world that persists when all the work is done. It's hard to guess from this perspective how the extended version of the film will wind down to its finish, but in this version, the building of little ending upon little ending, to a grand (and unexpected, for those who have not read the book) coda, and from there to the final quietly, utterly Tolkien-esque resolution, is the only way this trio of films could travel there and back again. This is not so much about Return of the King as about The Two Towers Extended Version, a much better film than the theatrical release. The theatrical release, in fact, left me wondering whether Peter Jackson had forgotten how to craft a movie and how to tell a story. The excuses bandied about by some critics of both book and film ("It's the middle of a trilogy, of course it isn't strong") were merely thatexcusesparticularly when one considers both the strength of the source material and the success of another middle-movie of a trilogy, The Empire Strikes Back (called, and I wish I could remember the name of the reviewer who said it, "the dark jewel of the Star Wars trilogy"). I'm glad to report my faith in Jackson's talent was swiftly restored. Action-packed battle-scenes (and distracting shots of the same family members cameo'd in Fellowship of the Ring) are all well and good, but there's a story in there, as well. And in fact the cameos don't stand out glaringly anymore when nestled into the complete movie. Some of the strange additions (for example, the arrival of that odd creature with the sly grin... what's his name... ah, right, Haldir the elf from Lothlorien) not only fit better into the flow of the film, that event in particular (the army of elves at Helm's Deep) becomes more poignant a farewell to the passing age of the world, something to reflect on when it's humankind that must unite with humankind in the third film. In commentary on the DVDs and in interviews, Jackson and his fellow screenwriters do a lot of swinging back and forth between apologetic and unaapologetic over their treatment of Faramir, who, in the theatrical release of the film, is certainly barely recognisable as the character beloved by so many readers of the book. The extended release shows that Jackson et. al. were not wanton in their rewrite. I recognised the Faramir in the long version; he is simply Faramir as he would react under slightly different circumstances. Faramir in the extended Two Towers is under so much pressure, it's not even the Ring that is compelling him. The Ring has less sway over him than the far more difficult to resist obligations of love, duty, and family expectations. The portrayals may be less than subtle, but small touches ground the characters in a down-to-earth, no-larger-than-life reality. When Faramir and Boromir turn to each other and laugh, with the same laugh, with the same toothy smile, you know they are brothers. When Faramir chooses to, well, veer from the original plot, it is never through lust for the Ring. That is a Faramir reconciled with the original. Give the extended version a try. And, after you've soaked it all in, listen to the actor commentary in general, and just try to keep a straight face. Listening to the enthusiastic cheers during the opening credits on opening midnight made it clear, if it wasn't already abundantly so, that girls and young women like the elf. "Viggo is so old, you can have him," remarked Megan, at around age 16, admiring Orlando Bloom's androgynous perfection. A certain slightly older set cannot resist the charms of Viggo Mortensen and will be glad to accept him, even as Aragorn goes from scruffily dirty and relatively cleanshaven, to filthy and intensely stubbly, to... well, I must say, that gentleman cleans up real well. Then there those discriminating types (ahem) who appreciate Viggo but gravitate toward Pippin ("I've met Billy Boyd, yah, he's cute as a button," was one report) and of course, to Faramir (played by, as he was known for far too long after we first read the cast list and scratched our heads over it, David Whatzit). So, at church the other day (Church of the Mediator, Anglican, in Kingsbridge, New York, big organ, subject for a different day's blog), I did a little informal survey. I was surprised to discover how many people of "the older generations" have seen and enjoyed this movie, and even more surprised by some of their perceptions and the consistency of opinion across a demographic joined by age and social class and relative education. Women in their 60s to late 70s all seem to focus on Elijah Wood and his large limpid eyes ("Are those real?" they ask in wonder. "Were they computer-enhanced?"). For whatever reason, he is the favourite characterthe persevering hero, struggling against all odds in a personal journey, preferred over the battles and epic transformation of a man into a king. Gollum, Eowyn, also were a focus of attention, the storylines this audience were most interested in discussing and reliving and understanding. Theoden, in contrast, was "Eowyn's uncle," and his fatalistic heroism and ethical struggle barely of interest. They also had no trouble whatsoever extrapolating the missing storyline of Faramir and Eowyn meeting and falling in love in the Houses of Healing (which scene I understand will be included in the extended version), just from the quick look between Faramir and Eowyn during the coronation of the king. I, and others in the younger set of folks, wondered how anyone could read anything into such a quick flash of a shot. In fact, I hurried after the end of the movie to explain to my mother what becomes of those two characters, but the "cow-eyes" seemed perfectly self-explanatory to her. Could it be something about how the films these women grew up with as kids were made, the romances where a look across a room told an entire story? 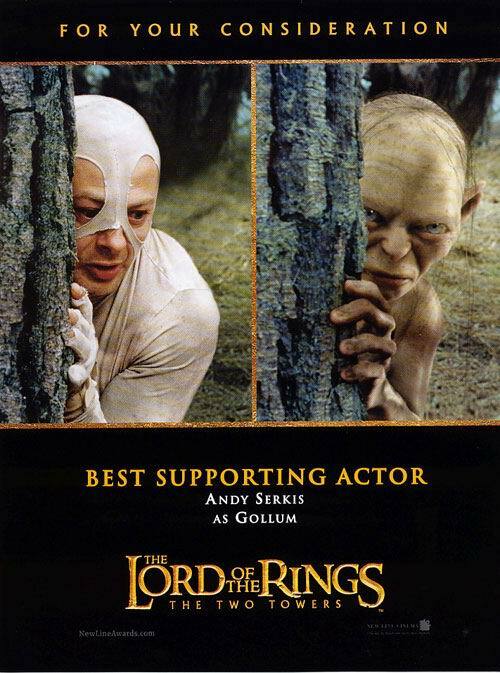 ...was given to Andy Serkis (Gollum) by the midnight crowd, regardless of whether or not the actor could see it. The New York Times recently speculated on whether the standing ovation on Broadway has become devalued into meaninglessness. It certainly has not at the movies, even when it is a expression of high appreciation only shared amongst the audience on the actors' behalf. It is not easily given, and it is not given as a matter of peer pressure, and it is given from the heart. Outside food for The Return of the King: Lembas. That is, some lovely wafer-thin vanilla crepe cookies. And some vegetable patties, because a hobbit needs six square meals a day, at least. But I was so swept into the movie I forgot to eat anything. Both at the first and the second viewing. I have forever been outdone in my outside-food endeavours, however, by the guy who brought a gallon of milk. Hidalgo: Viggo Mortensen. Horses. African desert. See this film. Harry Potter and the Prisoner of Aka... uhm... something: The preview looked good enough to make me want to see it, though I fell asleep on the first film and opted out of the second. The directorial hand, at least as expressed in the previews, looks much surer, the plot looks compelling. And, six words: Alan Rickman, Alan Rickman, Alan Rickman. The Chronicles of Riddick: I dunno. But I spied Dame Judi Dench, I'm sure of it. iRobot: Oh, sorry, I mean I, Robot. Rumour has it this movie strays from the Asimov original, but also speculates it simply blends his I, Robot with Caves of Steel to make an accessible plot of the books touting the Three Laws of Robotics. The trailer seemed so much like a commercial for a new iPod I didn't pay any attention to it until at the end it revealed its little secret. Clever. Too clever. No one will notice this is a film until the marketing department wises up and points out that Will Smith is in it.